LinkedIn gives you plenty of tools to find people to connect with. The Add Connections option allows you to link your email account with LinkedIn. 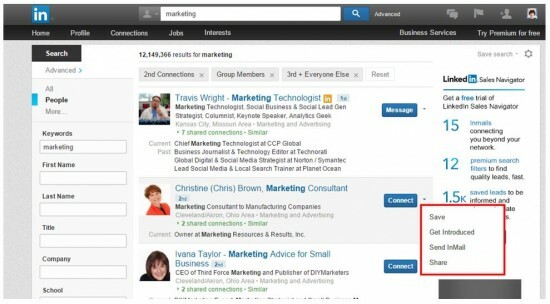 LinkedIn identifies profiles that match the email addresses from your email provider i.e. Gmail. You then choose those who you would like to send an invitation to. This seems like a great time saver, batch connecting, but it doesn’t allow you to send your own message. To maximise the number of people who accept your invitation, note down the suggested profiles and send them an individual request. I know, it seems like a bit of a faff but it’s still rare to receive a tailored message. Showing that small amount of effort is more likely to lead to the start of a conversation. After sending batch requests to your contacts on LinkedIn the final step is to invite people who don’t already have a LinkedIn account associated with the email address you have in your address book. The problem with this is many of them may already have a profile but use a different email address to login to their account. If someone doesn’t already have a LinkedIn profile they aren’t going to be a great connection so why send them an invitation? In the Connections tab you will find this feature which helps you to find people who went to the university you attended. You can search by year, where they live, what company they work for and by industry. I am sure most of you were better and more dedicated to their studies at University, that I was, so there will be quite a few people you recognise that you may have lost touch with. If you do have a university in common you can connect with your fellow alumni even if they are not a second or third tier connection. When you have no Ways to Keep In Touch pending on you home page you will been shown suggestions of LinkedIn users that you may know. This appears to be a great little tool to save time but it doesn’t allow you to write your own introduction message. If you do use this option you can always send a follow up message when your invitation is accepted. When you send an invitation to connect LinkedIn prompts you with a list of more People You May Know. Like Alumni you can connect with anyone who is in the same group as you. Spend some time in the groups you belong to, get to know the key players and then invite them to connect with you. This can really open up your network! Don’t you just love being able to check out who has been looking at your profile! The benefit of this function, not only satisfies the nosey parker that resides within you, it gives you an opportunity to connect with a different set of contacts. As they are already aware of you they are more likely to accept your invitation. A top tip for when you are connecting with people who have looked at your profile, don’t mention that’s where you found them. “I saw you visited my profile” comes across as creepy! Advanced search is a pretty nifty way of building your network strategically. Use it to look for people in specific locations and industries from your 2nd & 3rd tier connections and members of groups you belong to. If you want more criteria to add to your search ,such as function and seniority level, you will need to upgrade to LinkedIn Premium. You can use the free trial to see if paying for the monthly subscription is worth it for you. On the search results page you have 5 options for each results that appears. – Connect – again no opportunity to add a personal message. – Save into your contacts – you can access these via the Keep In Touch section in the Connections menu. – Get Introduced – if you have a mutual connection you can ask them to introduce you. – Send InMail – this is the LinkedIn email system. Perfect if you want to introduce yourself with more information that you can fit in the standard invitation message. – Share – this option opens up the message centre allowing you to share the details of the LinkedIn member with your LinkedIn connections. When I train people to use LinkedIn there is a hesitance to add people to your network that you don’t know. This is the online equivalent of going to a networking event and only talking to people you already have a relationship with. It feels safer, but ultimately it’s not the point of going. It doesn’t mean you should go gangbusters and click to connect with anyone who is in your LinkedIn universe. The value of your network is only when it is active. A network of thousands with no interactions is no different from looking at an online contact directory. – Are you in the same group? – Do have any common contacts? – Do you read their blog? Give them a reason to connect with you, for example if they are an industry influencer you can say you want to make sure you see their latest updates. Why not try out your connecting technique by linking in with me?